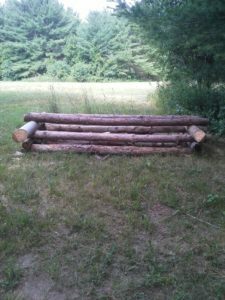 Wishing Stone Farm offers a fun and inviting cross-country experience for beginners and intermediate riders alike and is a great first venue for aspiring eventers/ foxhunters. 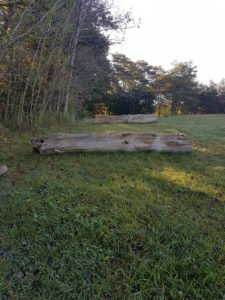 The jumps are inviting, beginner friendly/ intermediate, natural type obstacles to prepare horse and rider for entry to pre-training level eventing. The course is situated in rolling hills with good, well drained footing and consists mostly of sloping terrain amongst trees affording a variety of lighting conditions. Riders and horses will enjoy several jump combination options which create a versatile and progressive training challenge. •	Simple logs and verticals. 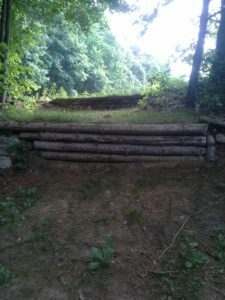 •	Bank/drop fence ( Pre-Training, Training Level). Also this location backs onto the East portion of the Ganaraska Forest with wonderful trails for conditioning.